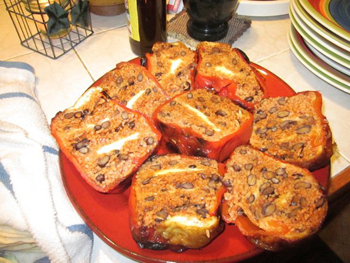 Note: Guajillo peppers, used in this recipe, are a dry pepper and can be found in Mexican markets and well stocked groceries. Toasting adds much better flavor to dry peppers. 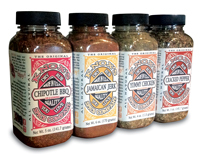 If you cannot find Guajillo peppers, omit the cumin and salt and use 2 Tablespoons chili powder. Cut the stems from the red bell peppers and remove the seeds and membrane. Set aside. Grind the guajillo pepper, cumin and salt into a powder. Mix with the cooked rice and black beans. 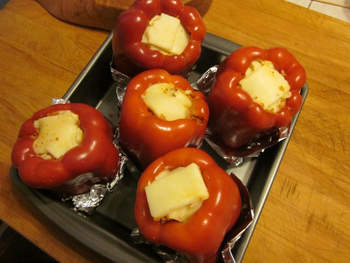 Put a couple spoonfuls of the rice mixture into a bell pepper and then place a slice of cheese, pressing down to compress it. Repeat until full and top with cheese. Repeat until all the bell peppers are full. If they do not stand up use tin foil to make a little holder for them. Grill indirect and covered or bake at or around 370 degrees for about 30 minutes. Remove from heat, let cool for 10 minutes, cut lengthwise into 8 servings and serve as a delicious side dish. Another Note: If you have left over rice and bean mixture it is excellent in wraps, quesadilla or as a side by itself.